IMO N? : 5225162 Classification Society: ABS General Cargo Ship Type Victory VC2-S-AP3 Ship?s Yard: California Shipbuilding Corporation., of Los ?ngeles, California. USA Hull N? : 1.263 Call sign: L. Q. C. G DWT: 10.869 GRT: 7.607 NRT: 4.549 LOA: 138,78 Mts. B: 18,90 Mts. D: 11,58 Mts. Cargo Gear: Derricks: 1 x 50 tons; 1 x 30 tons; 14 x 5 tons. One General Electric double reduction, cross compound turbine. Boilers: 2 8.500 CV. Propellers: 1 Speed: 15 Knots. 18 August 1945. Launched for U. S. War Shipping Administration. (MC № 701). Christianed Bellingham Victory. (Flag: U. S. A.) 29 September 1945. Delivered. 1946. Sold to Compa? ?a Argentina de Navegaci?n Dodero S. A. 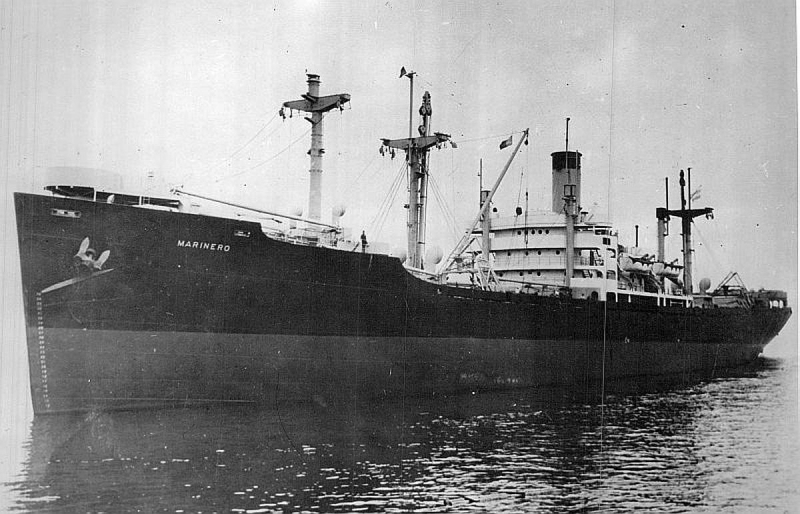 Renamed Marinero. (Flag: Argentina) 1949. Transferred yo the Government of Argentina after nationalizing the company. 1951. Transferred to F. A. N. U. Flota Argentina de Navegaci?n de Ultramar. - Marinero. (Flag: Argentina) 1961. Transferred to E. L. M. A. Empresa L?neas Mar?timas Argentina S. A. - Marinero. (Flag: Argentina) 1977. Sold to Fabricaciones Militares. 18 June 1977. Vessel scrapped at Puerto Galv?n, Buenos Aires, Argentina.